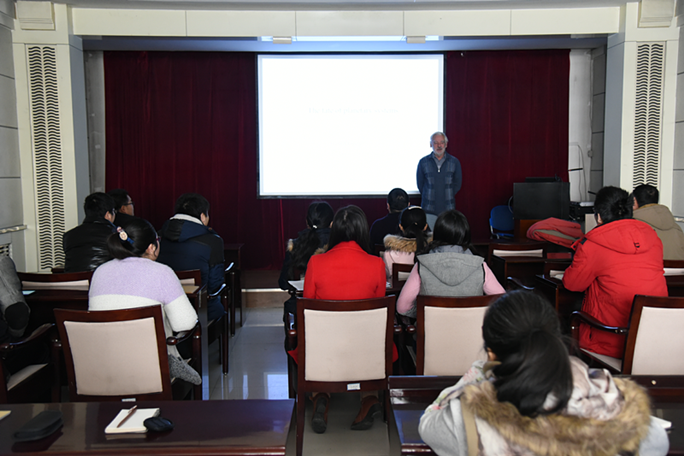 On March 2nd to 6th , Professor Gerard Vauclair ,director in National Centre of Scientific Research of France and famous expert in asteroseismology, visited Xinjiang Astronomical Observatory(XAO) on invitation . During the visit, he delivered an academic speech named “ The fate of planetary systems” for our researchers. He introduced the lifelong evolutionary process of a star, and the fate of orbiting planets. As the final evolutionary stage of stars, white dwarf is crucial to search other planet systems orbiting it, and to analyze the orbital parameters. And nowadays it has become a difficult and hot topic in astronomical research field . Professor Vauclair visited the Nanshan observatory, and got more understanding on the performance and structure of the 1-m Optical Telescope. Through communicating with our researchers, he think highly of the essential roles of the telescope in global campaign on pulsating white dwarf. This visit has enhanced the further cooperation relationship between XAO and Toulouse Observatory .